Picture a Day - The Holy Land Revealed: Today, It's Called "Forex." Then It Was Called "Money Changing"
﻿ For millennia the commerce of the world has had to deal with different currencies. The Bible refers to various coins, often a name referring to a specific weight. Every country, province, king or governor minted a local coin. 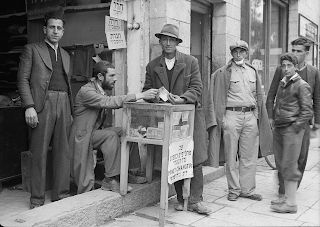 Travelers had to exchange one currency for another to do business. Over the centuries, the Forex (foreign exchange) professionals also served as bankers and loan officers. 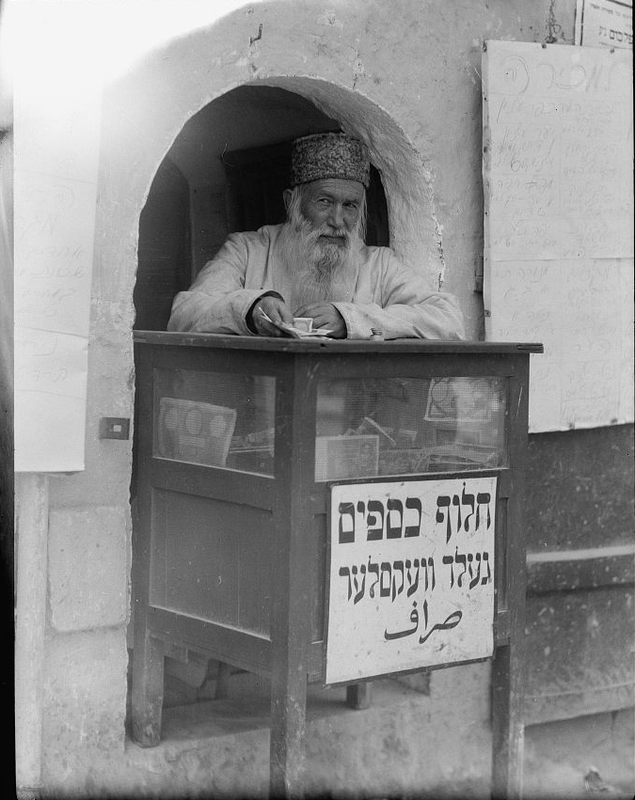 As recorded by the American Colony photographers, Jewish money changers set up their shulchan on the street. The signs behind the men are rental notices. It always interests me to hear about the humble beginnings of Forex. As a Forex affiliate trader, I make it a point to read and know every facet of this industry. Forex is very important today. It greatly affect how the market behaves. Buying stock, option trading, etc depends on Forex. It's really good to know these things. The evolution of money changing to forex trading is indeed a big change. Anyway, as a forex trader, I always make sure to learn details about Free Forex Trade Signals Service. You can really see how these words evolve from simple to a complex one. However, the main idea is still the same. Forex and money changing both involve money. Buying stocks and trade binary options are among the best propositions when it comes to Forex. It's so nice to read about some historical background on how forex trading evolved through the years. Today, forex and options trading are two things that can be considered good investments. Tying in with John Grints comments, the fundamentals of currency will always stay the same. However today we can see that there are many different methods of multiplying cash reserves. Binary Options today is changing the traditional broker business model, because of the fact that binary options broker change no fees. The speed with which retail traders can get marketing news some say reduces the need for commission paid brokers. Yes but the thing that you have to think about with all these trading forms, is whether they are actually dictating the way in which the markets behaves. While when trading with a binary options broker you are only wagering a contract 'outside' of the market, the increased retail use of spot Forex trading can only ever increase the volatility. perhaps the sums involved will limit this when compared to stocks... however in these markets the rise of the private investor has made these markets a much more dangerous place. These images kind of put me in thinking mode again. Imagine if the world's economies still relied on money-changers and not stock markets. Maybe it would easier to manage finances that way (then again, it had just as many flaws as the current system). I think at the same time that finance has become easier it has also become more complicated. Some people have commented as to how it is now easier to trade with a binary option brokers than maybe taking some different route to the investing on Foreign exchange. However one could also argue that every one did fine before they invested on these markets completely. To some degree it has just over-complicated the whole investment process and added to the volatility.